Mini Me Geology Blog » What Would You Do With A Limestone Rock? What Would You Do With A Limestone Rock? Limestone (shown left) is a fine-grained sedimentary rock that forms when calcium carbonate precipitates in a quiet ocean environment such as deep, calm water. You cannot see individual grains with the naked eye in a fine-grained rock. Limestone is often white, pink, red, gray or black. Fossils are common in limestone because the calm ocean allows the calcium carbonate to precipitate around a dead plant or animal part without significantly disturbing the specimen. There are many varieties of limestone. Coquina (shown right) consists of mostly animals parts, such as shells, that are glued together by calcium carbonate precipitation. Fossiliferous limestone (shown below left) is often a fine-grained rock with fossils present. Some samples have many fossils while others may only have a few. The types of fossils do not make a difference as to the rock’s designation as a fossiliferous limestone. Oolitic limestone is a rock composed of mostly calcite oolites. Oolites form when layers of calcite deposit around a sand grain or fossil piece and roll around in calm water, which makes them round. Limestone is useful in your home as attractive tiles and building stones. The variety of colors and types of limestone along with fossil rocks give these building materials a unique look. You can use limestone blocks and gravels to construct buildings, walls and garden paths. Crushed limestone mulch is beneficial for some plants in the garden because it helps to raise the soil pH before you install shrubs. Limestone’s biggest limitation is that it will dissolve in acid over time so it may pit from rain. 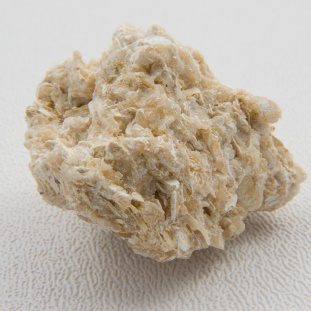 We have a great selection of limestone rocks including fine-grained, coquina, oolitic and fossiliferous for your projects and collections.